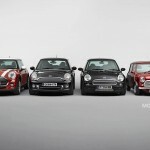 20 years ago BMW created a plan to revitalize the Mini brand. 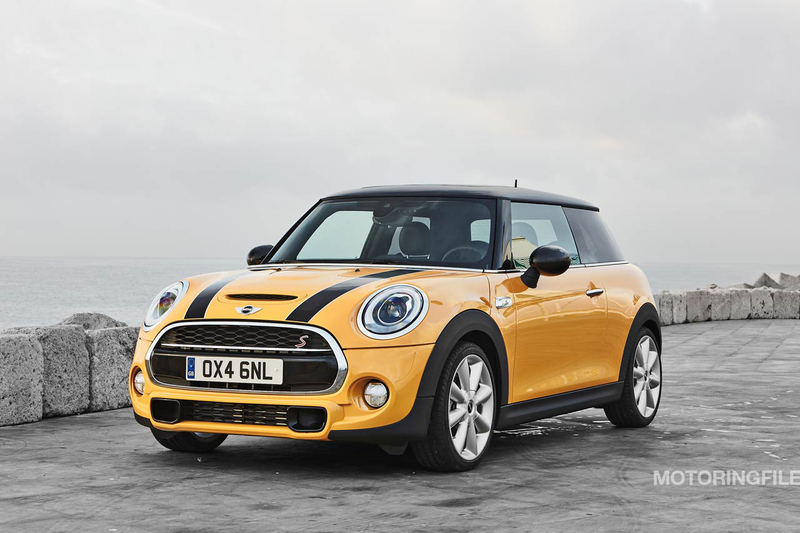 The idea was to create an entirely new car from the best of Mini’s heritage. Tapping into its history of performance and style, BMW combined that heritage with BMW’s renowned engineering prowess. 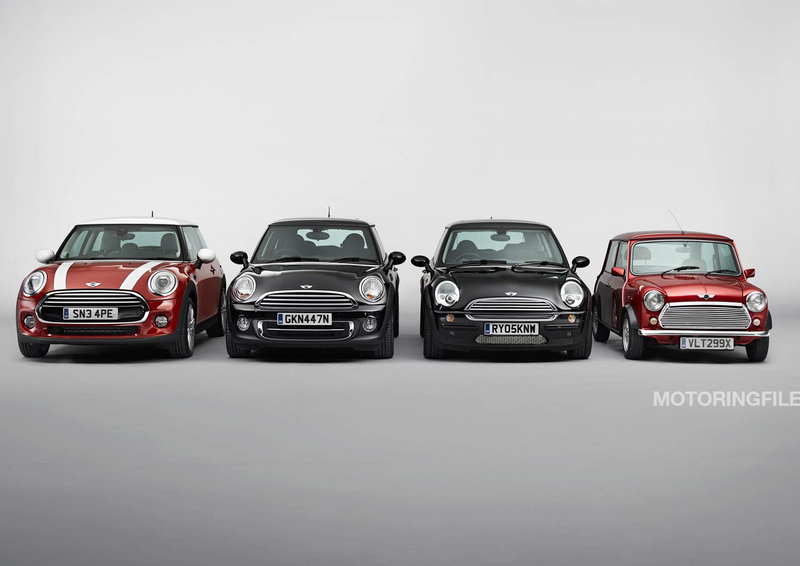 While the first two generations of MINI were wildly successful, we’ve never had a car 100% engineered by MINI/BMW. That changes today with an all new car. That car is the F56 and it represents the first clean sheet design since the R50 was launched in 2001. 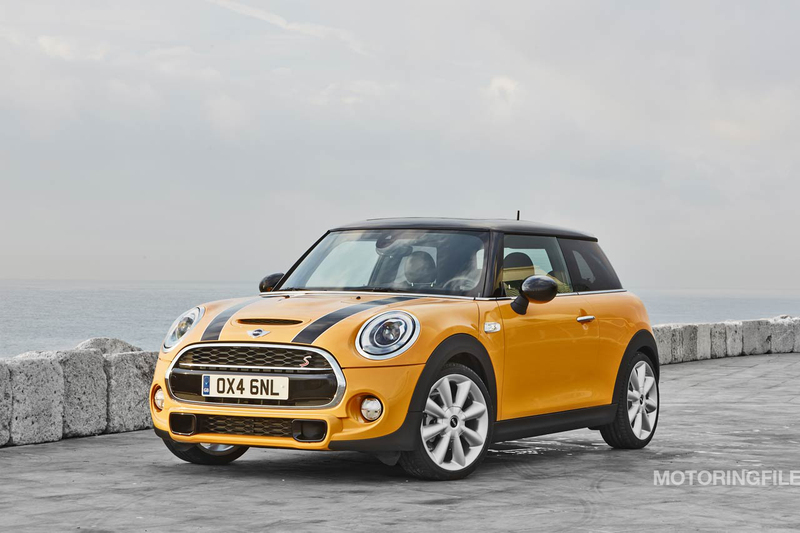 Today we can finally reveal a full set of official images and MINI’s official press release. Both do a great job diving into some of the highlights of this new car. In the coming days we’ll be breaking down the details of the new car, the new lineup of engines and the future of the F56 range. We’ll also be spending more hands-on time with the car getting to know all the things you can’t learn in the official press releases. But before we get into all of that, we have our first take on the new F56. Grab your favorite beverage, sit back and enjoy. This only happens once every seven years. 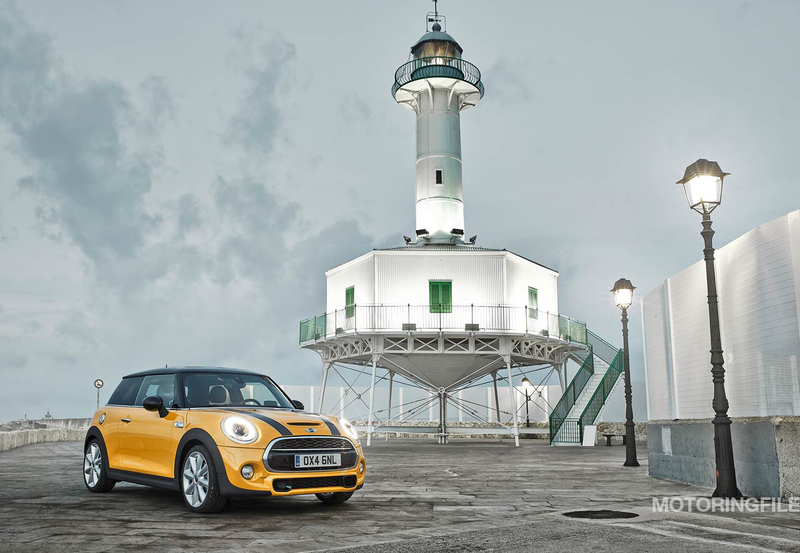 Stylistically the F56 takes the MINI design language and evolves it with an eye to both the past and future. The design is clearly contemporary, with details we first saw on the MINI Traveler concept in 2005. 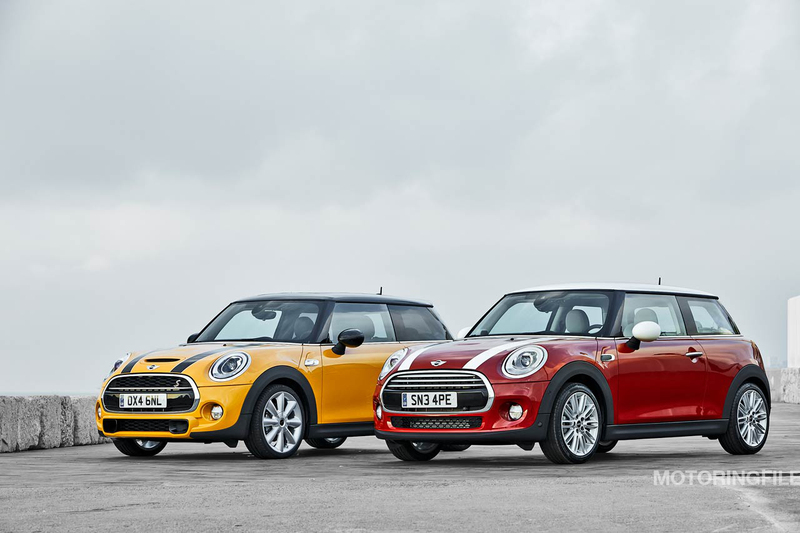 The design has been cleaned up — especially the Cooper — with a grill shape that mimics the Classic Mini’s more so than any MINI since 2001. In many ways, the F56 looks like an even more modern interpretation of the classic than the R56 ever has. 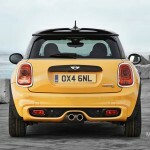 Styling is of course subjective, and I don’t expect everyone to like the F56 on first look. A lot has changed and there’s a lot to take in. We’ll have a much more thorough design analysis soon, yet in our opinion, the F56 is a car that makes more sense the more you see it — especially in person. Having seen the car myself, which I can definitely attest to that reality. Let’s do the numbers. Overall the car has increased 3.8” in length and 1” in width. Increasingly stringent pedestrian impact standards have increased the front overhang by a total 2″. However it’s worth noting that there’s no appreciable increase of weight in that area. Keep in mind that the increase in overhang is almost entirely empty space. The mandate from the EU regulations was to create space between actual front of the car and the engine and frame members. The wheels remain at the corners of the car’s actual center of mass, so that eagerness to turn in we all love will still be there. MINI went down to the millimeter to keep the nose as trim as possible, and this is much more apparent when you see the car in person. Beyond the nose, dimensions have shifted here and there. The wheelbase has increased by 1″ and the rear of the car is .8” longer. The extra space allows for more interior room and an extra 50L of boot space (enough for an extra mid-sized roller bag as compared to the R56). 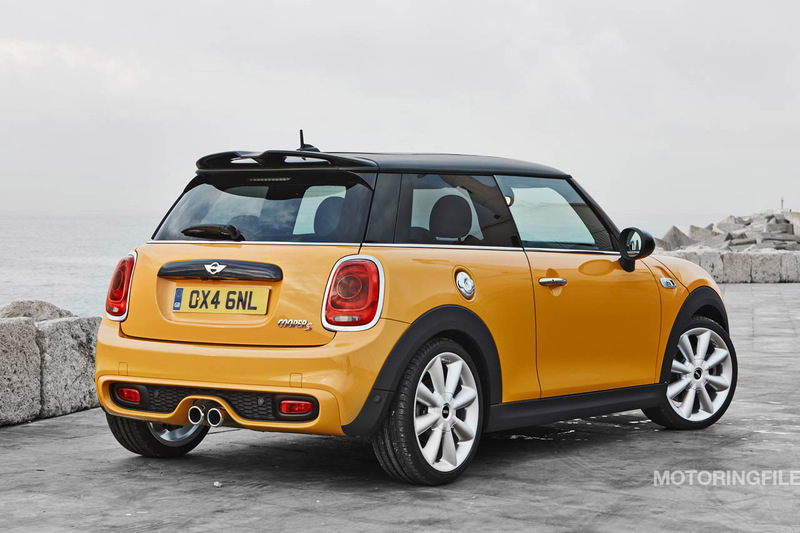 MINI has spent considerable time finding ways to lighten the car (especially un-sprung mass). However with the addition of new features, standard equipment and increased safety measures the new MINI is on average 60 lbs heavier than the F56. That makes it roughly equivalent to the R53 in weight. 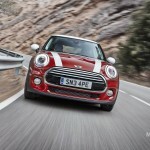 The F56 marks the first time that MINI has changed its wheel sizing throughout the range. 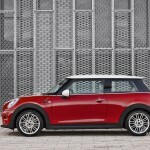 The Cooper will have more 17” wheel options and the Cooper S an JCW models (the latter coming in about 12-18 months) will offer 18” sizes from the factory. 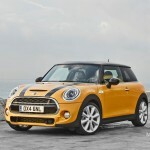 As you can see above the Volcanic Orange Cooper S looks noticeably more aggressive with the 18s. As much as the exterior is an evolution the interior is a revolution. Gone is the center speedometer and in its place a surprisingly useful Light Ring that works with many functions in the car constantly giving feedback. MINI has invested in soft-touch materials throughout the cabin to further increase the feel of luxury at every touch-point. The moment you step into the car the results speak for themselves. 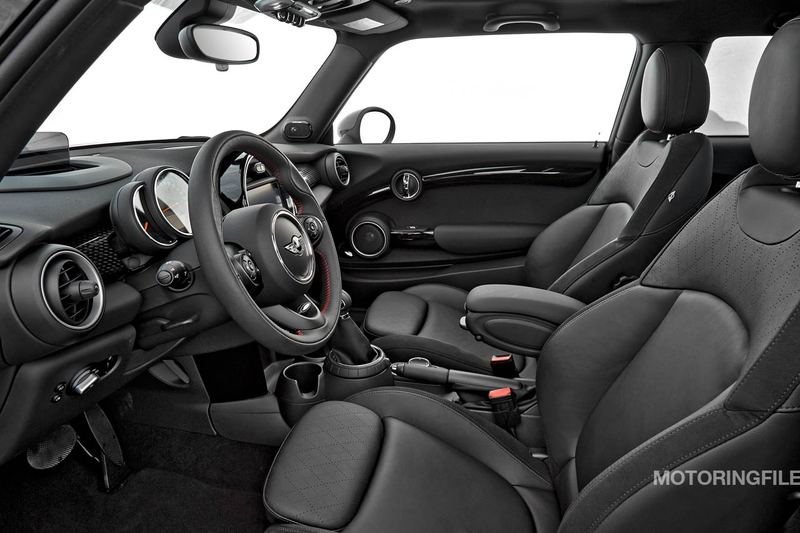 For the first time MINI has created an interior that is both comfortable, beautifully executed and full easy to use interfaces. Perhaps the highlight (at least for your author) are the optional sport seats complete with thigh-bolstering – giving those over 6’ tall much greater support and comfort. There’s also more aggressive side bolstering and much improved quality. The seats feature optional leather and Dinamica (similar to Alcantara) along with a host of patterns and colors that feel much more forward thinking than MINI’s current line-up. Finally there are the engines. The B37/B38 are built on a modular platform that increases .5L for every cylinder. That means that these engines essentially 1/2 or 2/3 of the revered 3.0L BMW inline six. Crucially, both engines are now turbocharged giving the Cooper more power and as much torque as the R53 Cooper S.
It’s interesting to see that the Cooper is now not only faster than the previous generation Cooper S in automatic guise but almost as fast as the original R53 Cooper S with a manual. Read on for all the highlights via MINI’s official press release below. And look for much more detailed information including videos, photos and plenty of hands-on time with the new F56 in the coming days. 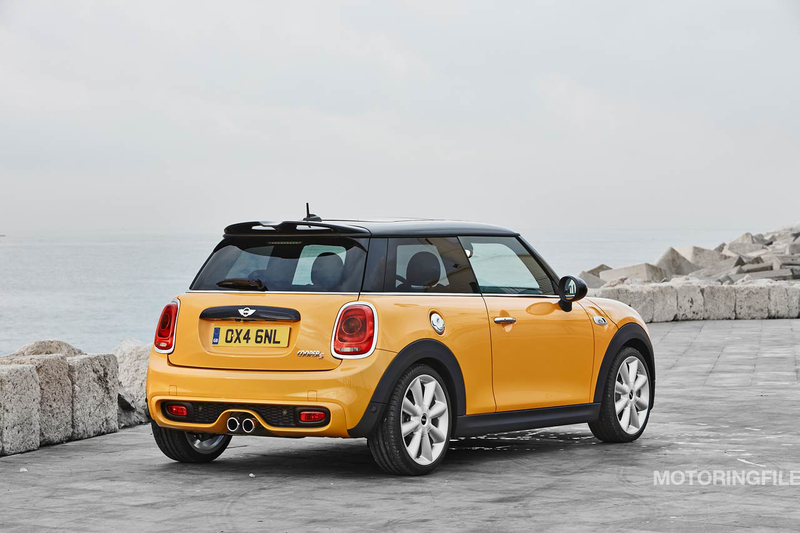 The new MINI Hardtop carries forward its predecessor’s aspiration to remaining the leading original of the premium small car segment, underpinning its outstanding position with significant advancements in all areas relating to driving fun, quality and individual flair. The evolutionary refinement of its design signals the more mature character of the new model, reflected in a significant optimization of such aspects as space, safety, fittings, materials and finish quality as well as sportiness and ride comfort. The enhancement of product substance embodied in the new MINI Hardtop derives directly from the BMW Group’s development expertise and takes on a more extensive form than ever before in the history of the brand. A new generation of engines increases driving fun and efficiency, and there is a wider selection of innovative driver assistance systems as well as MINI Connected infotainment facilities. LED headlamps and the MINI Head-Up Display are other highlights in the equipment program only previously found in higher vehicle segments, further underscoring the premium character of the new MINI. The new MINI Driving Modes allow an individual set-up involving not just the characteristic curve of the accelerator and steering but also engine acoustics, and in the MINI Cooper S – provided the relevant features are present – ambient lighting, the shift times of the automatic transmission and the characteristics of Dynamic Damper Control, the latter system being optionally available for the first time. The modes SPORT and GREEN can be activated in addition to the standard MID mode. In conjunction with an automatic transmission, the efficiency-oriented GREEN mode also features a coasting function with decoupled drivetrain. Exterior design: unmistakable proportions, striking lines, high-end highlights. 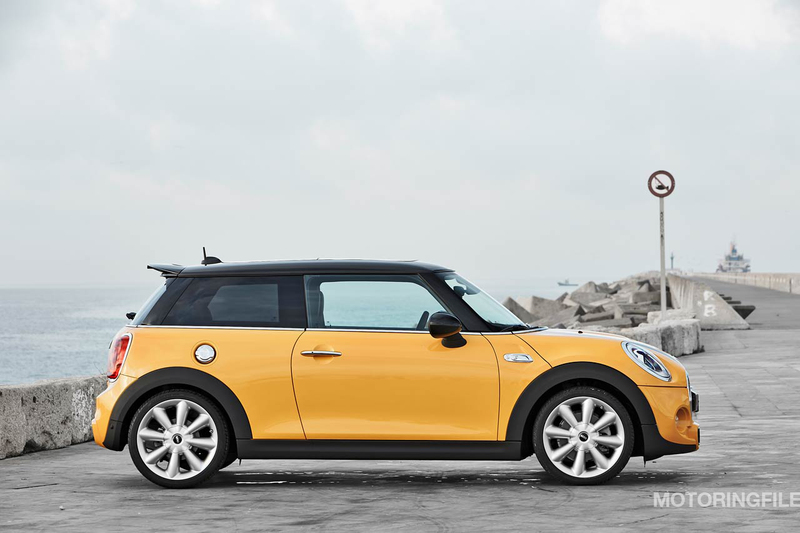 The new MINI Hardtop sets out to continue the global success story as the first ever premium automobile in the small car segment. 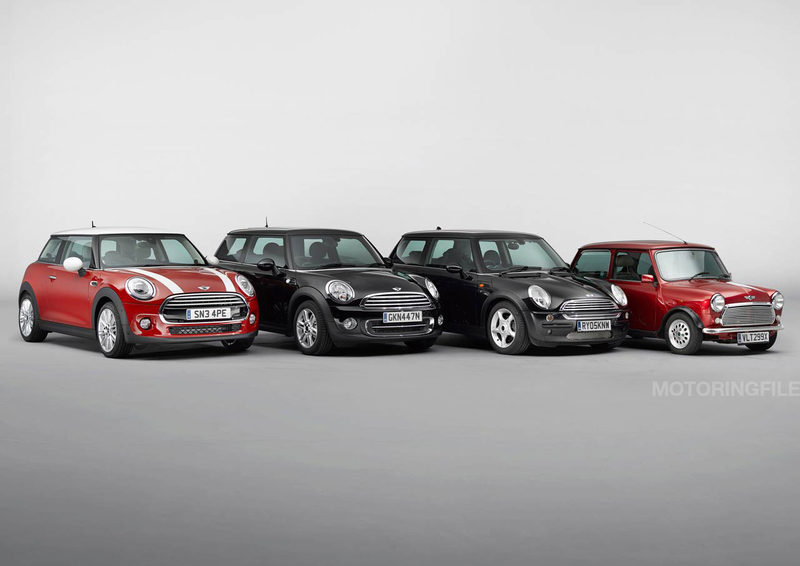 At the same time it carries forward the tradition of the classic MINI that stretches back over more than 50 years. Its design reflects these historical roots, as well as an evolutionary refinement of the modern vehicle concept. The hallmark brand proportions have been preserved thanks to precisely defined expansion of the exterior dimensions. 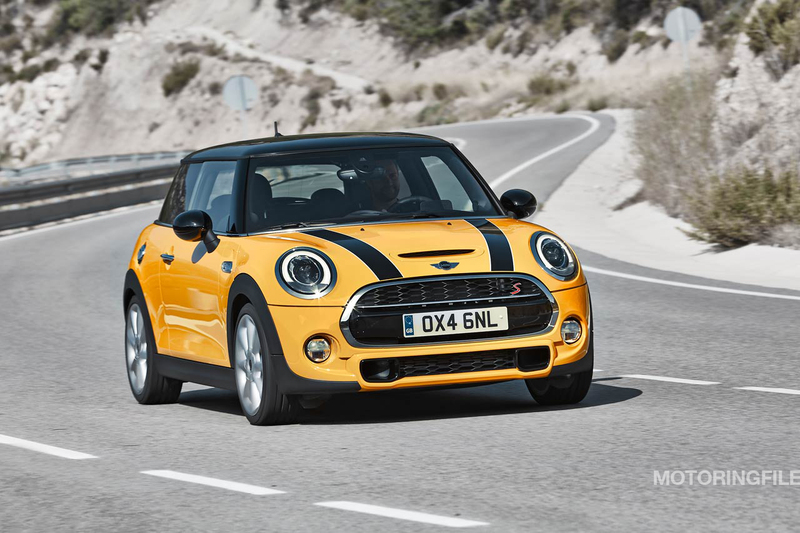 These also help give the new MINI a compact and powerful appearance which symbolizes its agile character, geared consistently towards inspiring driving fun. 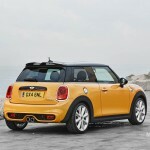 The body of the new MINI Hardtop is 151.1 inches long (MINI Cooper S: 151.9 inches), 68 inches wide and 55.7 inches high. This makes it 4.5 inches longer, 1.7 inches wider and 0.3 inches higher than its predecessor. 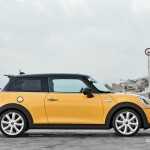 The wheelbase has been extended by 1.1 inches to 98.2 inches, while the track width has been enlarged at the front by 1.7 inches and at the rear by 1.3 inches to a total of 59.1 inches in each case (MINI Cooper S: 58.5 inches). Cornering agility and ride comfort benefit from these new dimensions as do the amount of space available to occupants and the luggage compartment volume. The extended adjustment range of the front seats, a seat surface lengthened by 0.9 inches and a perceptible increase in shoulder room provide more foot space and freedom of movement as well as optimized entry comfort for rear passengers. Luggage compartment volume has been increased by 3 cubic feet to 8.7 cubic feet. 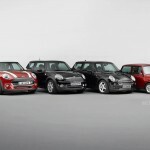 Like its proportions, the car’s hallmark brand styling and the three-way separation of body structure that is so typical of MINI both contribute to its unmistakable appearance. The body, greenhouse and roof on top are clearly separated from one another in visual terms. The glass surface with the dark body columns forms a harmonious cover extending across the entire automobile. 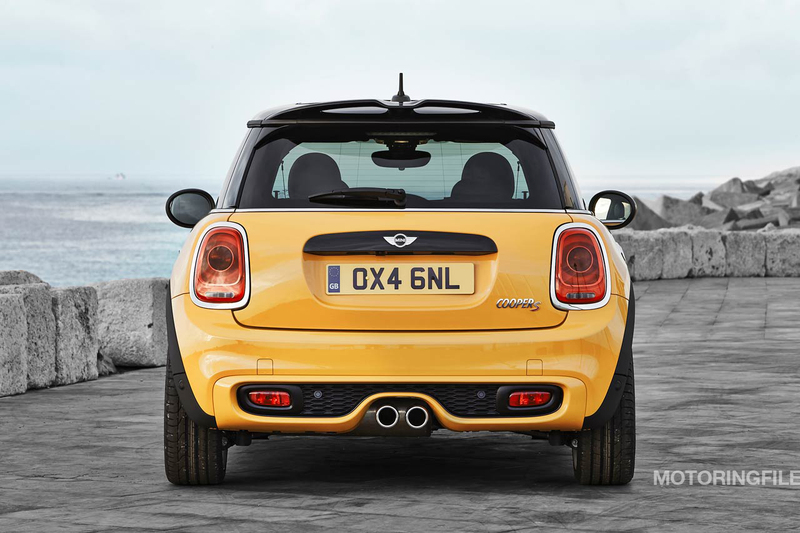 From the side view, the window graphic tapering off to the rear creates a dynamic wedge shape which is suggestive of the forward thrust characterizing the new MINI. The wide track and short overhangs emphasize the vehicle’s body more strikingly than ever before as it sits powerfully on top of the wheels. 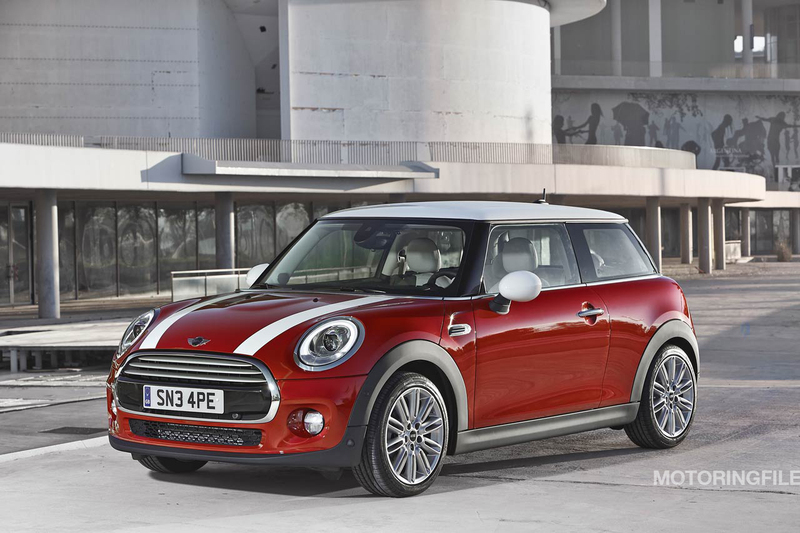 The athletic stature of the new MINI Hardtop is additionally underscored by the visual link between the front and rear wheel arches. This is created by means of a striking sill line along with a character line running above and virtually parallel to it in the side view. The two lines feature a dynamic downward curve at both front and rear, thereby directing attention to the two large wheel arches. Traditional design features such as the hexagonal contour of the radiator grill, the side indicator surrounds known as side scuttles, the circular headlights, the upright rear light clusters and the black periphery around the bottom edge of the body are reinterpreted. Selected design features are given a particularly high-end emphasis by means of a novel surface design in their specific environment. The contours of the headlamps, rear light clusters and wheel arches are highlighted by means of precise edging. The visual effect of the side scuttle elements and the additional headlights in the front apron is enhanced by means of striking lines on the adjacent surfaces in each case. 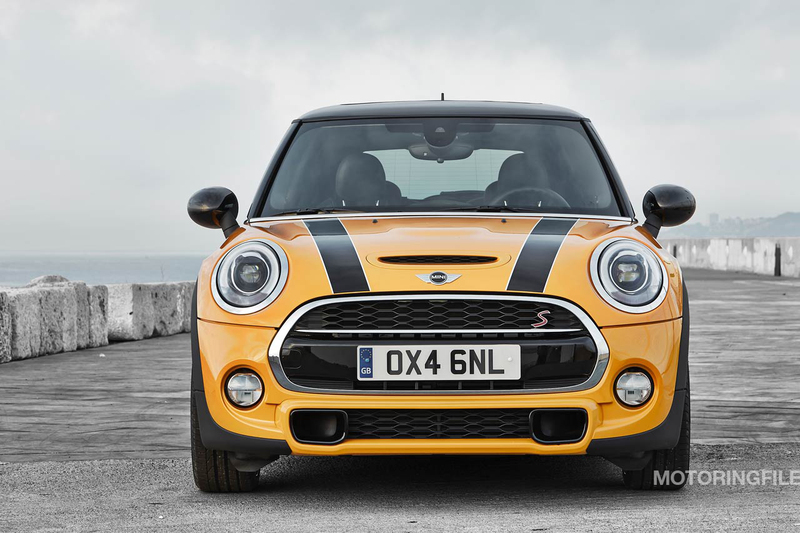 The MINI Cooper S draws its model-specific sporty flair from such features as a radiator grille with honeycomb pattern, an additional opening in the bonnet, brake air ducts integrated in the lower air inlets and a separate rear apron with exhaust tailpipes arranged at the center. In addition to the side scuttle elements, the radiator grill of this model variant now also bears an “S” logo with chrome surround. Unique in the segment: LED headlamps and adaptive light distribution. Detailed design revision has been applied to both the classic circular headlamps, featuring a wide chrome ring surround, and the circular additional headlamps integrated in the front apron. The light sources of the headlamps are clearly structured, with the arched turn indicators arranged in the lower section. In the standard version, the daytime driving light and the side light is produced inside the additional headlights, while fog lamps can also be included here as an optional extra. 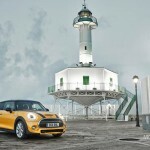 The new MINI Hardtop is the first car in its segment to offer the option of LED headlamps. The bright white LED units provide the light source for both low and high beam. They are also surrounded by an LED daylight driving ring, the lower section of which reaches down to the white turn indicators. Another option is an adaptive light distribution function that ensures optimum illumination of the road surface and roadside – depending on situation and route profile – and also includes a turning light. The fog lamps are available in LED, according to preference. In conjunction with the LED headlamps, the rear light clusters also come as LED units. 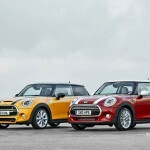 For the market launch of the new MINI Hardtop, the selection of exterior body finishes has been extended to include five new colors. The roof and exterior mirror caps can be finished in a contrasting color – white or black – as an option and at no extra cost. 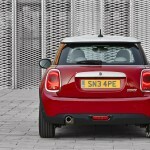 Roof rails are also available for the new MINI for the first time. Other ways of adding a touch of individual style include white or black bonnet stripes and Chrome Line for the exterior. Interior design: hallmark MINI style, new display and operating concept. 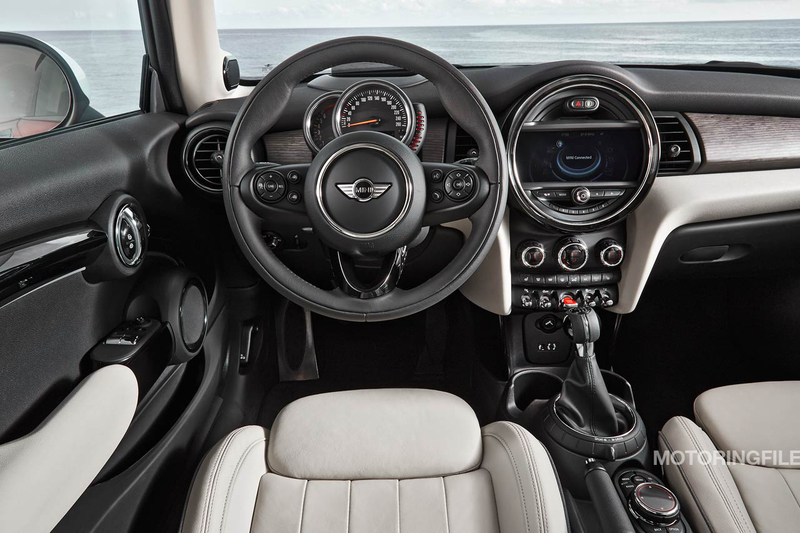 Precise lines, high-end color and material combinations and modern functionality highlight the orientation of the new MINI towards driving fun and a premium interior ambience. 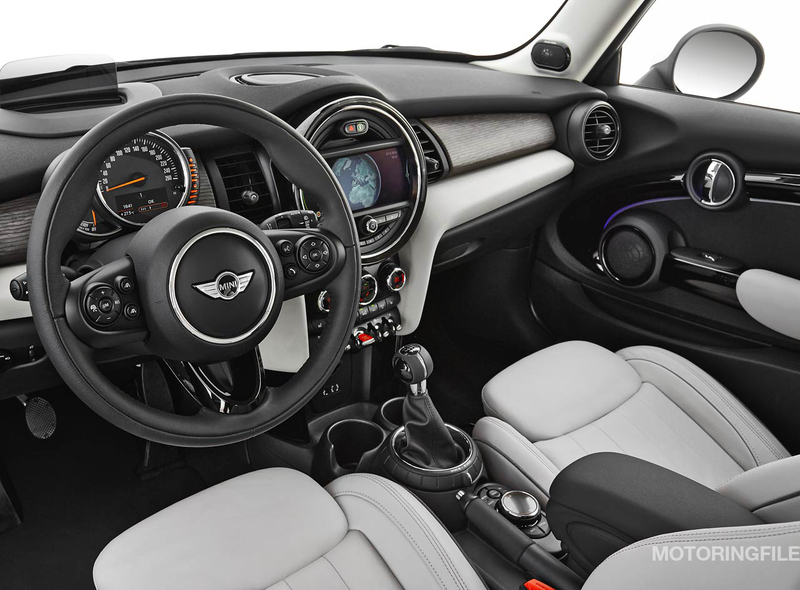 The horizontal structure of the cockpit and the circular or elliptical contours of key features such as air outlets, instruments and door trim elements are classic design components which take on a more sophisticated and especially high-quality form in the new MINI. A new display and operating concept provides the ideal basis for safe, intuitive and convenient control of the driver assistance, infotainment and comfort systems, which have been significantly expanded in terms of the functions available. One of the most important new features is the instrument cluster on the steering column. Road speed, engine speed and fuel level are displayed on horizontally arranged circular instruments. The speedometer scale includes a color panel for Check Control messages, vehicle status displays and visual indicators relating to driver assistance systems currently activated. Key insertion as previously required is no longer necessary in the cockpit of the new MINI. 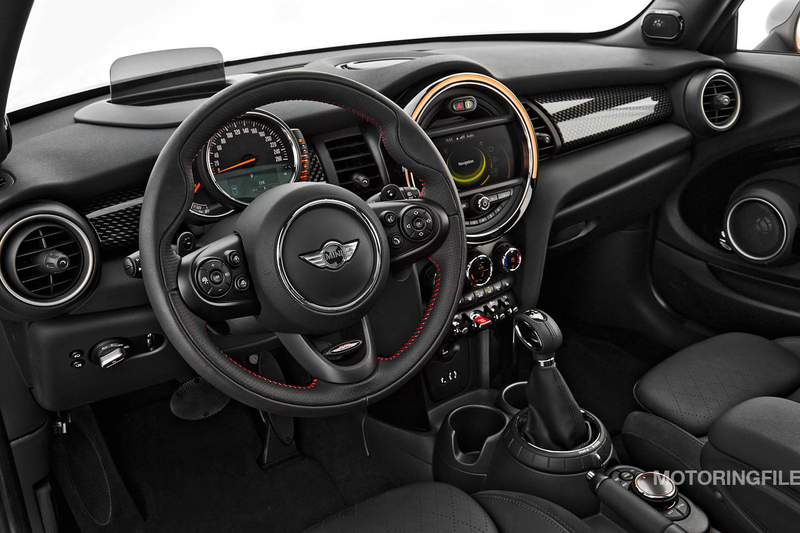 As soon as the key is inside the car, the engine of the new MINI can be started by pressing the toggle-type start/stop button located in the middle of the center console, which lights up red. Above the toggle switch there are three circular control switches for heating and air conditioning. The operating switches for the headlamps and fog lamps have also been repositioned and are now located on the instrument cluster next to the steering wheel. 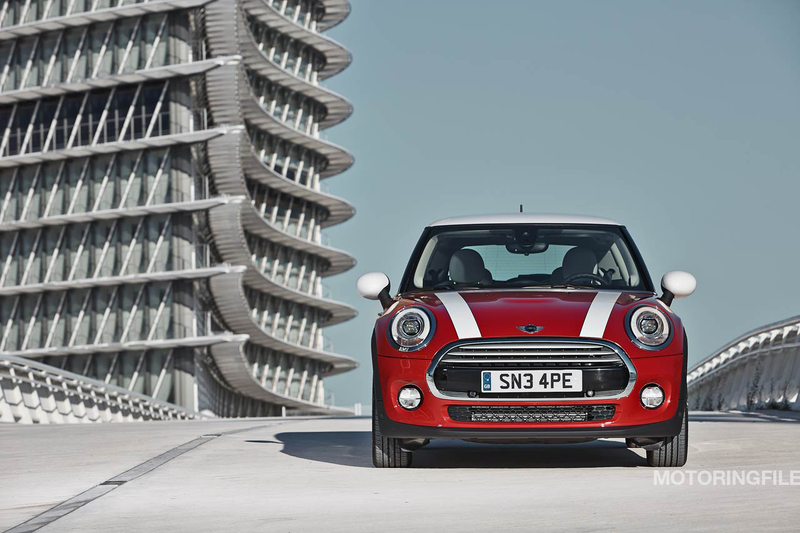 The electrically controlled power window lifts in the new MINI are integrated in the door trim panels. Central instrument with new functions and impressive lighting configuration. With its new indicator elements and extended functionality, the hallmark MINI central instrument intensifies interaction between driver and car. 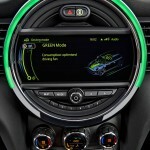 Depending on the car’s fittings, the center of its interior surface serves as a 4-line TFT display or else a color screen up to 8.8 inches in size which shows operating feedback for vehicle functions, infotainment and communication, navigation maps and route directions as well as the special graphics for MINI Connected Services. The selection and control of these functions is facilitated by a new controller in the center console which comes in conjunction with the Radio MINI Visual Boost or the MINI navigation system. Rotary, pressure and shift movements as well as one-touch and bookmark buttons allow for intuitive, safe and convenient operation based on the principles of the BMW iDrive system – a ground-breaking force throughout the entire automotive sector. 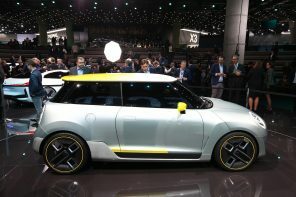 The innovative display and operating concept is supported by a lighting design in the area of the central instrument which is unique to MINI. LED units around the outer edge of the circular instrument – available in six colors – can respond to the current situation on the road and to specific operating steps, according to driver preference. For example, the hand movements of the road speed and engine speed display in the instrument cluster are underpinned by light impulses at the edge of the central instrument. When Park Distance Control is activated, the remaining distance to obstacles is shown by means of a ring of light which is illuminated in green, yellow or red – supplementing the graphic display. A change in the desired interior temperature is confirmed by LED units which light up in blue or red. Route guidance information provided by the navigation system is also visually supported by the illuminated ring: the closer the car gets to the turn-off point, the smaller the lit-up area at the edge of the central instrument. Typical MINI diversity of colors and materials for maximum individual flair. Increased interior space and a wide range of clever details make for further advancements in the area of functionality. The rear backrest with a 60 : 40 split is not only foldable, its tilt angle can be adjusted too. Numerous cup holders and storage facilities make it easy to take drinks and travel utensils along in the car, and there is an additional storage compartment behind the decorative strip on the passenger side. A storage package is also optionally available that includes a double load compartment floor, additional lashing eyes and nets for the luggage compartment, along with map pouches for the backrests of the front seats. Seats in a fabric/leather combination and leather finish are offered as an alternative to the standard leatherette version. 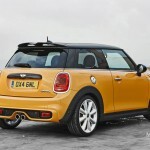 The MINI Cooper S is fitted with sports seats as standard: these are available as optional extras for Cooper variants. A model-specific selection of upholstery colors, interior surfaces, Color Lines and other design features – including Chrome Line for the interior – offers a wide range of possibilities for interior customization. 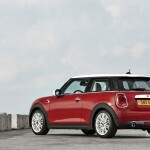 The launch of the new MINI sees a change of generation in the area of engines. 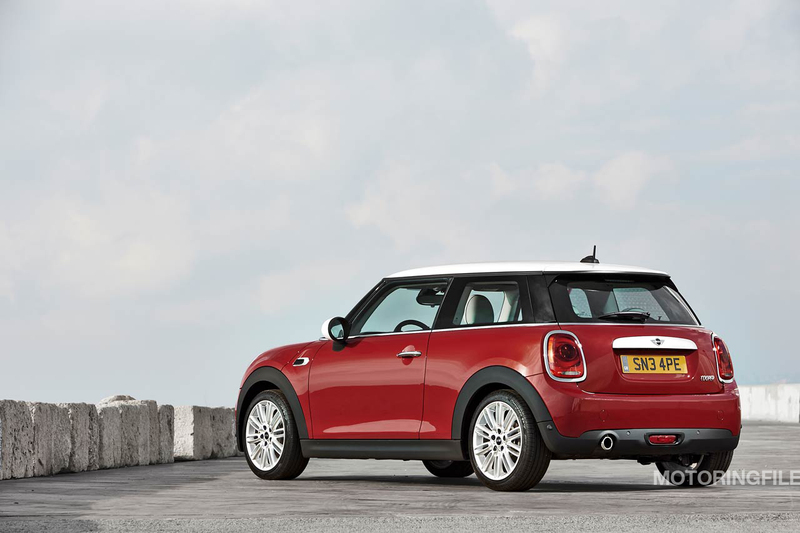 For the first time both 3-cylinder and 4-cylinder engines are used, all featuring MINI TwinPower Turbo Technology. In the new MINI Cooper and the new MINI Cooper S this includes turbocharging, direct fuel injection, variable camshaft control on the intake and exhaust side (double VANOS) and variable valve control in the form of VALVETRONIC, as patented by the BMW Group. The result: a further boost to driving fun along with increased efficiency. With output increased by 13 bhp to 134 bhp between 4 500 and 6 000 rpm and a maximum torque of 162 ft-lbs. (170 ft-lbs. with overboost), now available at 1,250 rpm, the 1.5-litre 3-cylinder engine in the new MINI Cooper also enables much sportier driving performance than the predecessor power unit. The new MINI Cooper sprints in 7.4 seconds (automatic: 7.3 seconds) from standing to 60 mph, while its top speed is 130 mph in each case. For highly spirited power delivery, the new MINI Cooper S is powered by a 2.0-liter 4-cylinder engine with a peak output of 189 bhp which goes on stream between 4,700 and 6,000 rpm, delivering its maximum torque of 207 ft-lbs. at 1,250 rpm. Torque can even briefly be increased to 221 ft-lbs. by means of an overboost function. As a result, acceleration from zero to 60 mph takes just 6.5 seconds (automatic: 6.4 seconds), while the top speed is 146 mph (automatic: 145 mph). New manual and automatic transmissions with optimized efficiency. The manual and automatic transmissions, also newly developed, make an additional contribution to improved efficiency. 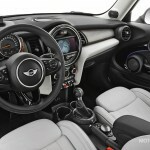 The new MINI is fitted as standard with a 6-speed manual transmission which differs from the predecessor model in its optimized weight and improved shift comfort deriving from the use of carbon friction linings for the synchronizer rings. A centrifugal pendulum in the dual-mass flywheel compensates for torsional vibrations, thereby enhancing the acoustic and vibrational properties of the drive system when travelling at low engine speeds for greater fuel efficiency. A new gear sensor also enables active engine speed adaptation for especially sporty shifting when accelerating and increased comfort when shifting down. The 6-speed automatic transmission available for all variants of the new MINI offers improved efficiency, enhanced shift comfort and increased shift dynamics. These advancements have been achieved by means of elements such as a more efficient transmission control system, a more direct connection and optimized hydraulics. The new MINI also combines automatic transmission with the automatic engine start/stop function for the first time, preventing unnecessary fuel consumption caused by idling at intersections or in congested traffic. An additional option is the 6-speed sports automatic transmission which enables even shorter shift times and can be operated in manual mode using shift paddles at the steering wheel. In conjunction with the MINI navigation system, the automatic transmission is also able to take account of the route profile in controlling gear shifts. Based on navigation data, the appropriate drive position is selected to match the imminent situation on the road, e.g. directly prior to junctions or on corners. This prevents unnecessary upshifts between two bends in quick succession, for example. 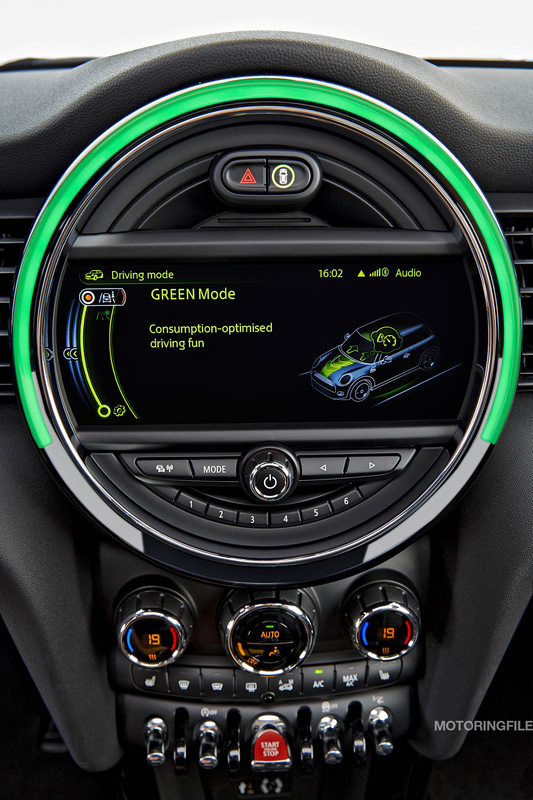 The MINIMALISM technology which comes as standard includes not only the automatic engine start/stop function and extensive measures to optimize weight and aerodynamic drag in the new MINI but also a shift point display function for automobiles with manual transmission, brake energy recuperation and needs-oriented control of the fuel pump, coolant pump and other ancillary units. The electromechanical power steering is equally as energy-efficiency as the map-controlled oil pumps in all engines. Depending on the model variant, a significant optimization of aerodynamic properties is achieved by such measures such as extensive underbody trim and air ducting elements in the upper section of the C columns. 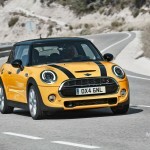 With a drag coefficient (Cd value) of 0.28, the new MINI is the segment leader in terms of aerodynamics, too. 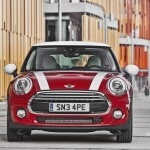 The new MINI Driving Modes provide an excellent basis for fuel efficient motoring. A rotary switch at the base of the gear or selector lever is used to activate the standard MID mode, the SPORT or the GREEN mode. In addition to the characteristic curve of the accelerator and steering and engine acoustics, the MINI Driving Modes also influence the ambient lighting, the shift characteristics of the automatic transmission and the Dynamic Damper Control configuration in the MINI Cooper S – provided these features are present. The choice is between a set-up which is very sporty, comfortable and well-balanced or geared towards fuel efficiency. In GREEN mode – supporting a relaxed and more fuel-efficient driving style – the energy used by electrically powered comfort functions such as air conditioning and exterior mirror heating is reduced. In cars fitted with automatic transmission it is also possible to use the coasting function. The drivetrain is decoupled at speeds of between 31 and 99 mph as soon as the driver removes their foot from the accelerator pedal. 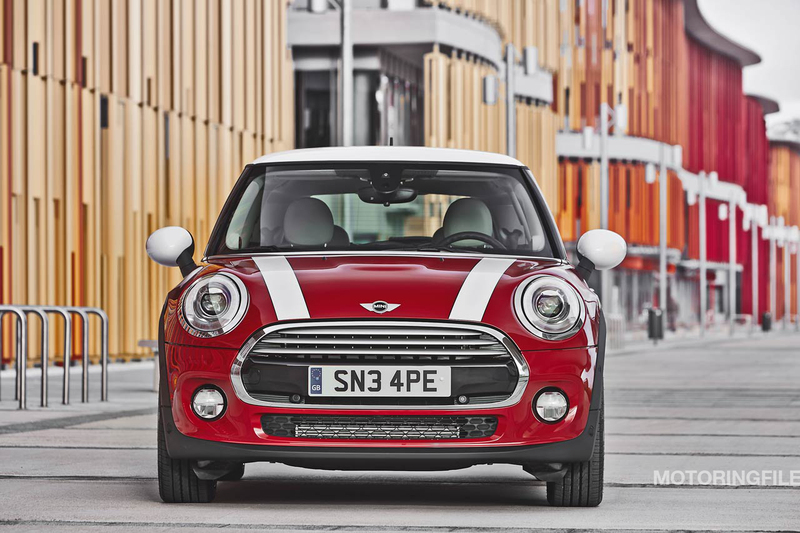 The new MINI then rolls at idling engine speed at a rate of minimal fuel consumption. The refinement of suspension technology in the new MINI keeps to the design principle of the single-joint spring strut front axle along with a multilink rear axle that is unique among competitors, as well as extensively optimized components in terms of material selection and geometry. 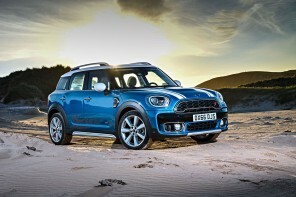 All improvements are aimed at intensifying the agile MINI handling, commonly known as the go-kart feeling. The set-up of the wheel suspension, body mounting, vehicle suspension, damping, steering and brakes increases the engine power and highlights the typical MINI concept consisting of front-wheel drive, transversely mounted engine at the front, low center of gravity, short overhangs, wide track and rigid, weight-optimized body structure. In order to optimize weight and increase component rigidity, the new front axle is fitted with aluminum swivel bearings as well as axle supports and wishbones made of high-strength steel. 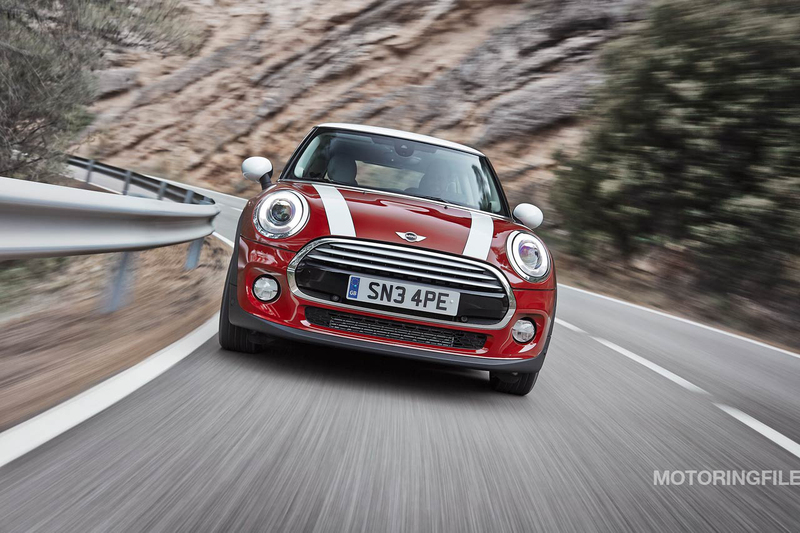 The modified front axle kinematics support the agile turn-in response and precise steering sensation of the new MINI. The share of high-strength steel used in the rear axle has also been increased. Tube-shaped stabilizers at the front and rear axle contribute to weight optimization. There is also an innovative axle bearing which benefits both ride comfort and agility. 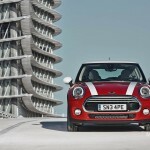 Premiere for Dynamic Damper Control in the new MINI. The newly configured suspension and damping systems have been reduced in weight. The dampers are decoupled at the front and rear axle by means of triple-path support bearings. Another new addition to the MINI equipment program is Dynamic Damper Control. Two characteristic lines are available for damper set-up, allowing activation of either a more comfort-oriented response or a direct, sporty response to road surfaces, depending on the given situation. The compression and rebound stage are adjusted by means of electrical control of the EDC valves. The electromechanical power steering has also been further developed. So-called torque steer compensation prevents self-steering tendencies caused by differing degrees of torque at the drive wheels. Steering precision has been optimized for sudden avoidance swerves and when taking bends in very sporty style. Standard features also include the speed-related steering assistance system Servotronic. 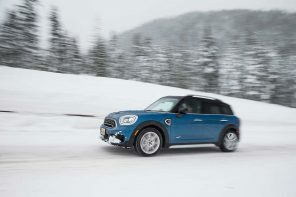 In addition to the anti-lock system (ABS), electronic brake force distribution (EBD), Cornering Brake Control (CBC) and the brake assistant, the Dynamic Stability Control (DSC) in the new MINI also includes a drive-off assistant, a brake dry function, Fading Brake Support and Dynamic Traction Control (DTC) mode, which permits controlled slip at the drive wheels on loose sand or deep snow. When the driving stability system is deactivated (DSC Off mode), there is an electronic locking function for the front axle differential which selectively and appropriately brakes a spinning drive wheel on tight corners, redirecting the drive torque to the other wheel. This system, known as Electronic Differential Lock Control (EDLC), promotes the car’s forward momentum without negatively influencing self-steering response. The new MINI Cooper S also features the Performance Control system, which counteracts any tendency to understeer prior to reaching the threshold level to support an agile yet neutral driving response on bends. 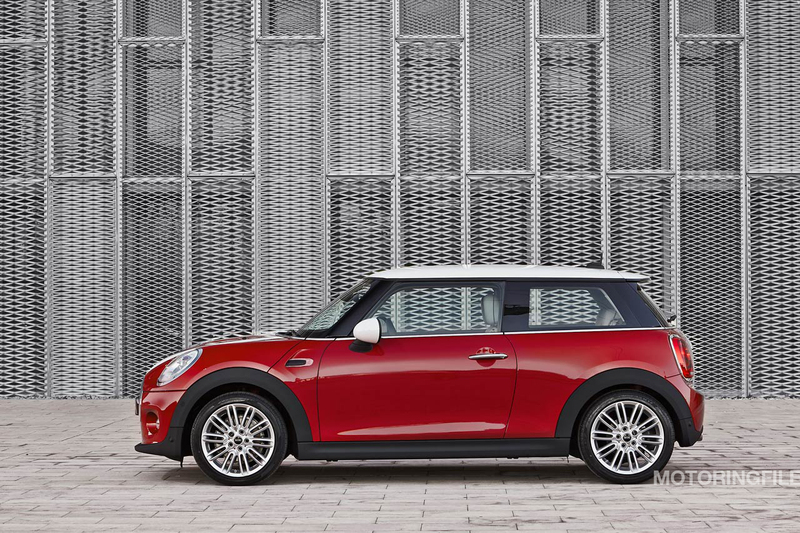 The 15-inch forged light alloy wheels of the new MINI Cooper have a particularly low weight as well as favorable aerodynamic properties. 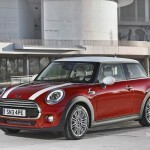 The new MINI Cooper S is fitted with 16-inch light alloy wheels as standard. Other light alloy wheels up to a size of 18 inches are available. Optimized weight, more safety and greater agility due to intelligent lightweight construction. 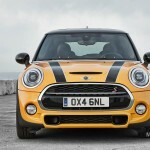 Further development in the body area was focused on optimizing structure, which impacts positively on both the driving properties and the crash response of the new MINI. Intelligent lightweight construction means that weight reduction in the new MINI is combined with an increase in rigidity, thereby promoting both agility and occupant protection. Highly resilient bearing structures, deformation zones in optimum design and an extremely stable passenger cell provide an excellent basis for keeping impact energy away from passengers and ensuring maximum occupant protection. 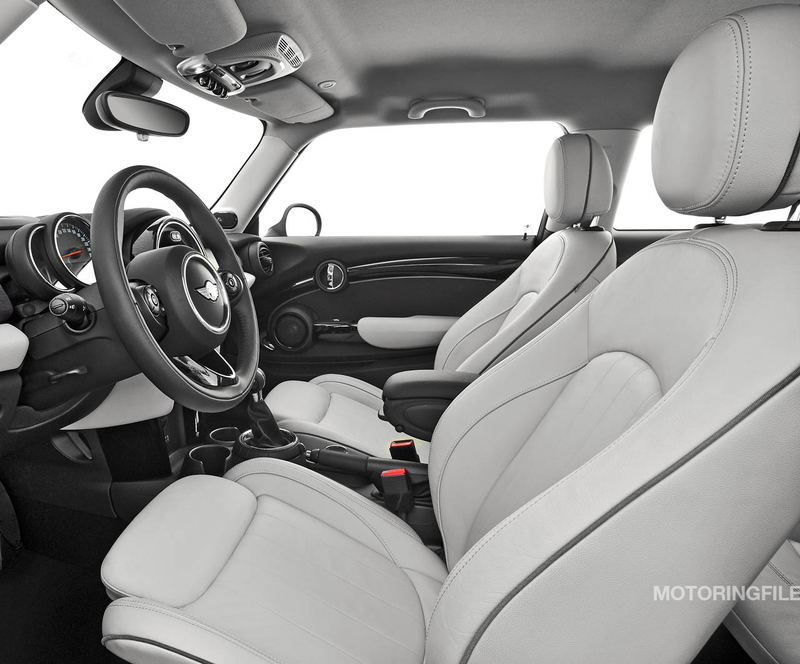 The standard safety fittings of the new MINI comprise front and side airbags as well as curtain airbags for the front and rear seats and two additional airbags to protect the knees. All seats are fitted with 3-point seat belts with belt tensioners and belt force limiters at the front and ISOFIX child seat mountings provided at the rear. There are also impact absorbers and precisely defined deformation elements, all of which are elements that minimize the risk of injury to pedestrians. Further evidence of the technological progress in the new MINI is the program of driver assistance systems – available for the first time in a model of the British brand. New features include the MINI Head-Up-Display which shows information relevant to the driver on an extendible monitor in the upper section of the dashboard between the windscreen and steering wheel. The MINI Head-Up Display promotes concentration on the road by displaying information directly in the driver’s line of sight. It can then be read quickly and conveniently without averting one’s eyes from the road. The information that can be shown in the MINI Head-Up Display includes speed, navigation directions in the form of arrow graphics and junction sketches, visual signals for collision warning, display symbols generated by Speed Limit Info, Check Control messages and entertainment program details such as radio channels and track titles. The graphics on the screen are clearly visible in all light conditions. Other innovations in the area of driver assistance systems for the new MINI include the Driving Assistant option. This comprises a camera-based cruise control and distance control function, which automatically maintains a distance from the vehicle ahead, and the collision and pedestrian warning system with initial brake function. In critical situations, the driver is first provided with a visual signal in the form of a graphic symbol that appears in the instrument cluster; this is supplemented at the second warning level by an acoustic signal prompting the driver to react. In addition to this, an automatic brake maneuver is triggered in the case of an imminent collision with a pedestrian or if there is a risk of a rear-on collision in urban traffic. Here the new MINI is decelerated at medium brake force. Depending on the situation, this can either prevent an impact occurring altogether or else significantly reduce the severity of the accident. As the automatic deceleration is activated, the driver is also given an unmistakable prompt to intervene. Other elements of the Driving Assistant include speed limit information on the current route, and also the high beam assistant, which takes into account environmental brightness, as well as oncoming vehicles and those travelling ahead when controlling the high beam. 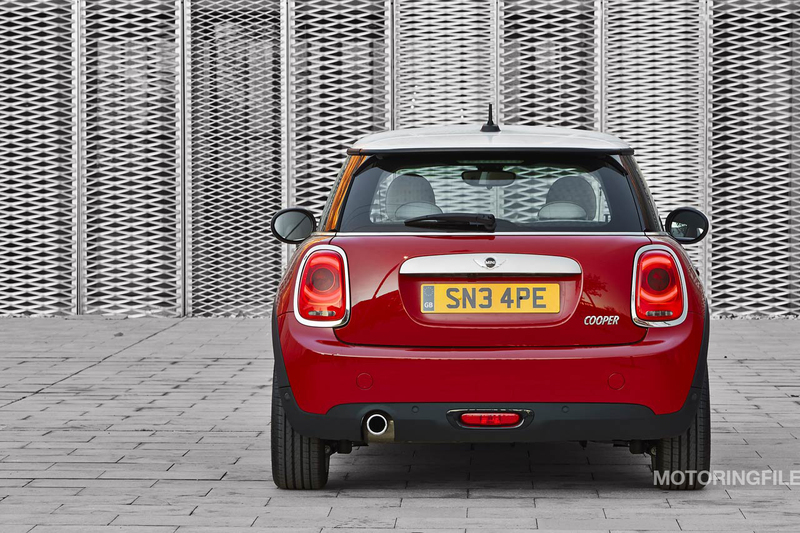 A rear view camera and parking assistant are also available for the new MINI. The video images supplied by the rear view camera underneath the tailgate handle are shown on the on-board computer in the central instrument as an aid when maneuvering and reverse parking. Meanwhile, the parking assistant facilitates selection and use of parking spaces parallel to the road. The system automatically detects suitable parking spaces at the roadside. As the car then maneuvers into the chosen space, the parking assistant takes care of all the necessary steering movements on behalf of the driver. All the driver has to do is operate the accelerator, brake pedal and gear selection in order to move safely and conveniently into the parking space. 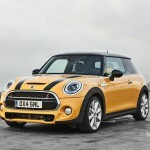 The standard features of the new MINI include electrically adjustable exterior mirrors, door sill cover strips with model-specific inscription, Color Line in Carbon Black and the MINI Radio including AUX-In and USB interface: these can be supplemented with a range of high-quality options in the areas of comfort, functionality and individual flair to adapt the car to one’s own personal style. In addition to the air conditioning system, standard in both Cooper and Cooper S models, there is also a 2-zone automatic air conditioning system, seat heating for driver and front passenger, a panoramic glass roof, rain sensor and automatic light control, and the Harman Kardon hi-fi speaker system and a sports leather steering wheel, including optional multifunction buttons and cruise control. Other options include Comfort Access, Park Distance Control, roof rails, electrically heated and folding exterior mirrors, and both interior and exterior mirrors with automatic anti-dazzle function. For customization of the exterior and interior in hallmark brand style, options also include a rear spoiler in John Cooper Works design as well as various decorative trim styles for roof and exterior mirrors, bonnet stripes, seat upholsteries, interior surfaces and Color Lines. MINI Connected; apps now also available for Android smartphones. 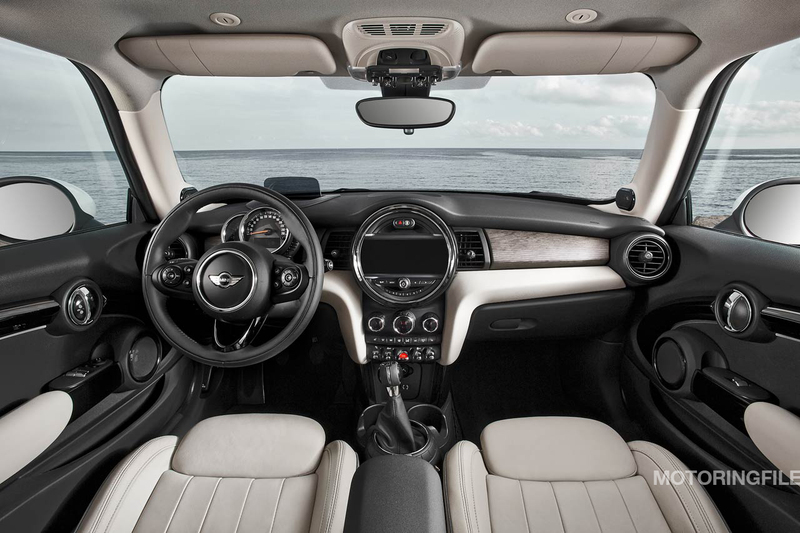 The MINI connected option is also available in conjunction with the Radio MINI Visual Boost and the MINI navigation system. It offers extensive integration of smartphones in the car, allowing the use of internet-based services in the areas of infotainment, communication and driver experience. These are provided via apps whose functional diversity is being continuously expanded. In future, both the MINI Connected App and the so-called MINI Connected ready Apps supplied by third-party providers will be available not just for the Apple iPhone but also for smartphones using the operating system Android. The MINI Connected program provided through smartphone apps includes vehicle-related functions such as Mission Control, Dynamic Music, Driving Excitement and MINIMALISM Analyzer, as well as online-based services such as a web radio function, the use of social networks such as Facebook, Twitter, foursquare and Glympse, the reception of RSS news feeds and entertainment features such as AUPEO!, Stitcher, Audible, Rhapsody, TuneIn, MOG, Pandora and Amazon Cloud Player. With the color display in the central instrument, all functions can be operated in typical MINI style – and more comfortably, intuitively and safely than ever before.